Zotero is a powerful knowledge management tool that allows you to collect, organize, cite, and share your research material. Zotero automatically senses content from within your browser, allowing you to capture records into your personal library with a single click. You can capture a journal article, a news story from the New York Times, an image, a web page from anywhere on the WWW, or citations to a book from our university library. You can also capture your own ideas. Zotero collects all your research material in a searchable database. You can add PDFs, images, audio and video files, web-page snapshots, your own comments, and many other items. Zotero automatically indexes the full-text content of your library, enabling you to later search for items in your database. You can create folders, subfolders, keyword tags, and manually Relate items. Zotero will allow you to create footnotes, endnotes, in-text citations, or bibliographies from your captured materials. Create citations in Word and OpenOffice without ever leaving your word processor. Add references to an email, a Google Doc, or other editors simply by dragging one or more references out of Zotero. For additional information about citation practices see our Citation-Style Guides page. NOTE: Use EndNote format to download from the I-Share book catalog. "My thoughts were a jumbled mess at first, but that jumbled mess became very organized with tags, relations, and folders. This site will be used my entire time at Saint Xavier University. This site should be taught to everyone because it can help everyone manage projects and outline papers." "As a freshman, this program is a very useful tool, and for future projects as an undergrad, graduate student, or even in the work place, Zotero can make researching information much less time consuming. This is a great tool that should be introduced to college students sooner than later." "I definitely plan on using Zotero in the future and I know that it will help me organize my thoughts and materials." The student started by wanting to document examples of "real" exorcisms. We discussed creating a Zotero folder for exorcisms with the following Tags (subject headings): geography, religion, spoken languages, inexplicable by other means or fraudulent. During the course of the exploration and annotation it became obvious that exorcisms were not just Christian experiences, that languages were spoken from far away locations, and that there were both supporting and damaging reports on these events. A more balanced and complete understanding of the nuances in the topic was experienced through the use of this tool, and the resulting paper was considered an excellent analysis of the broader question. 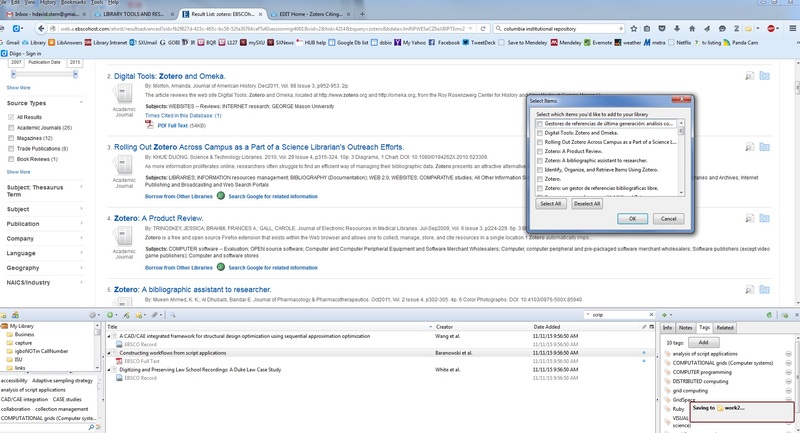 View an overview video of Zotero (downloading multiple records, searching within saved records). 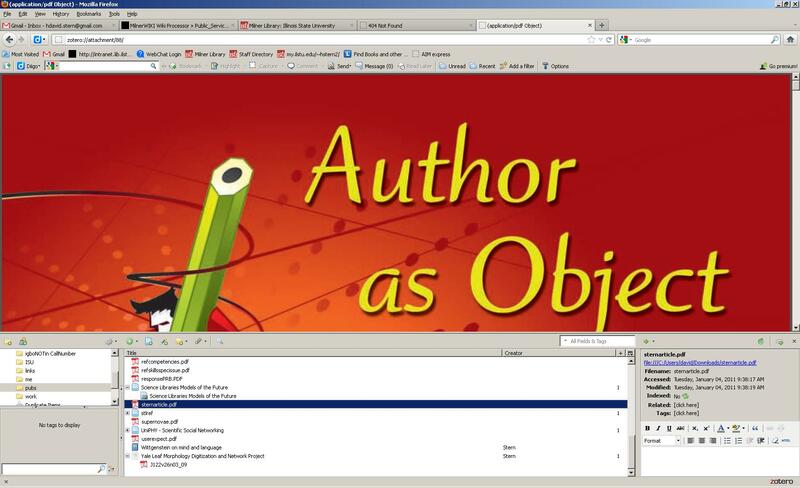 View a brief tutorial on using Zotero to add references and create a bibliography in Word. View a brief tutorial on using subfolders to organize your materials and developing nuanced support structures. You might also want to review Jason Puckett's Guide to Zotero and the Oregon State University Zotero Help pages. We have created a more complete analysis (75 pages) of how Zotero demonstrates advanced PKM possibilities. Synchronize the cloud and your software...add your password, select your citation style, and make PDFs searchable using the checker. the linker that synchronizes with Word (to merge information into references and bibliographies) is now embedded. Start the standalone version, select Edit/Preferences, then Sync ... add the account information (using your password from above). then in Preferences, under Search, install the checker ... to automatically index the full text materials you download. in Preferences, under Cite and Export, you can set your default citation style. the Zotero add-in (bottom pane) ... capturing multiple citations and fulltext documents from the top pane. the Zotero add-in (bottom pane) and viewing a previously downloaded fulltext document in the top pane.